After its war-related destruction on March 22nd 1944 the Goethe-Haus was rebuilt in keeping with it original appearance. It was also given back its pre-war furniture. Annually more than 130.000 visitors from all over the world come to see the Goethe-Haus. They are being shown the statley rooms on the first floor, the music chamber, Goethe senior`s library, with the window through which the young Goethe was being watched when coming home. Also, there is the room in which Goethe was born, where to the present date his certificate of baptism is on display. 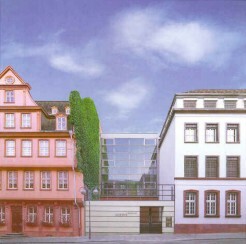 Adjacent to the Goethe-Haus is the Goethe museum containing valuable writings and paintings. After four years of restructuring and renovations the museum has become an even more attractive place to visit.